As you may know, I’m kind of obsessed with California sportswear. Tabak of California is one of the oldest, possibly in operation as early as 1936, long before WWII encouraged American designers to develop a forward-thinking American look to replace the leadership of Paris during the occupation. So when I found this set at the Vintage Fashion Expo a few weeks ago, I couldn’t help but try it on and subsequently add it to my collection. Louis Tabak, the company’s founder and president, is an interesting character. He was born in Russia in 1894, emigrating with his family to New York when he was 7 years old. After World War I, he spent a year at NYU studying business, and moved to Los Angeles as a salesman for Happy Home Washdresses, which retailed for 98 cents each. According to his obituary, he and his brother Max soon established Tabak of California, believed to be the first California sportswear brand, and he would continue to be instrumental in promoting California fashion. Later, Tabak was well known in Los Angeles for his philanthropic efforts, including providing major funding for City of Hope, a tuberculosis care facility turned national research center focusing on cancer. 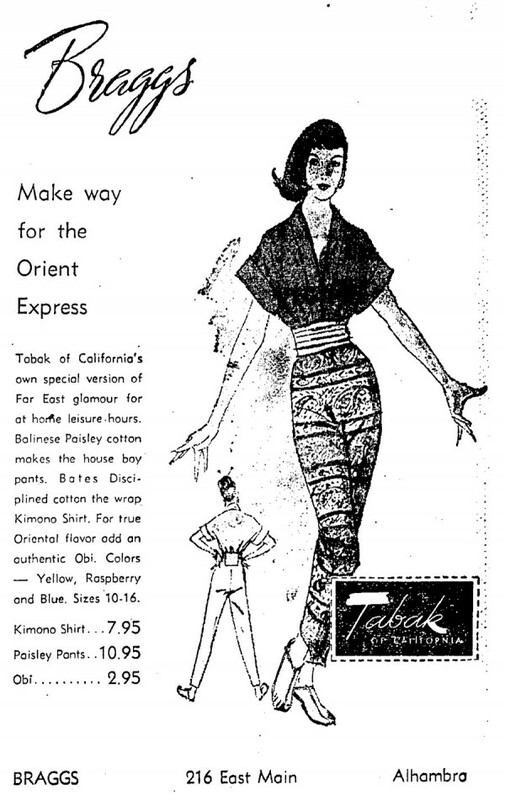 Tabak began manufacturing women’s sportswear in the 1930s. Tabak & Verb (together with partner Martin Verb) manufactured blouses in the early 1930s, and Tabak of California probably began sometime before 1938 (Max died of tuberculosis that year), much earlier than most West Coast sportswear brands, which didn’t really become that prolific until after WWII, during which the fashion center of Paris was cut off from the rest of the world, and American designers had an opportunity to flourish, innovate and define American fashion. 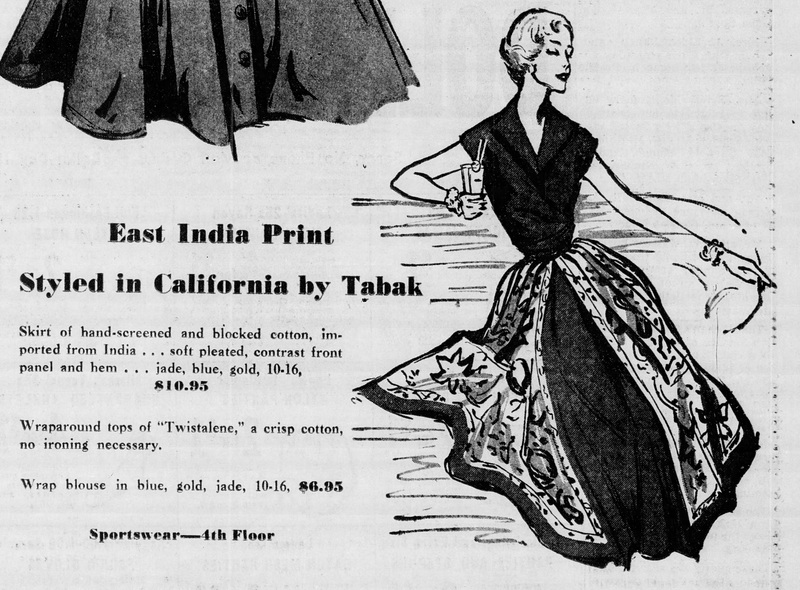 The earliest reference to Tabak of California I could find is 1947, and by 1948 the label was well-known in fashion circles for its versatility and practicality. 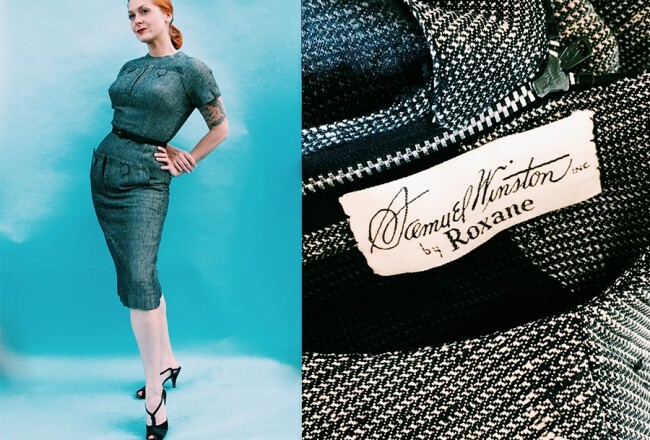 Classic one-piece dresses for spectator wear, skirts and jackets, shorts and bras, peddle [sic] pushers or slacks are made to be interchangeable. Skirts lengths remain at 12 inches and pedal pushers follow suit. Sun dresses feature practical, easy skirts and some of the prettiest models show sailor collars cut out with doughnut techniques to leave only a deep frame outlining the décolletage. 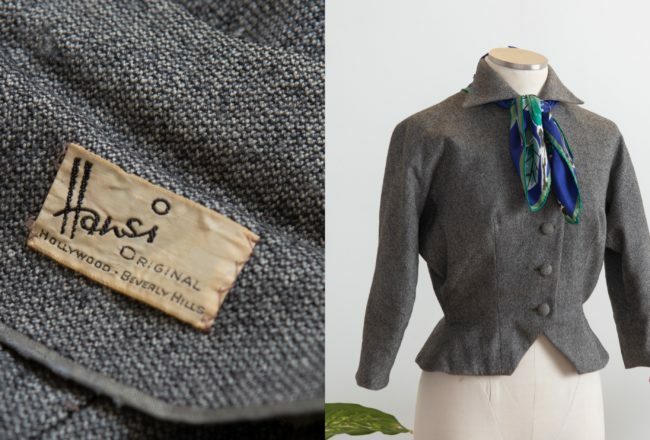 As with many of these American sportswear companies, Tabak himself was not a fashion designer. He was a businessman, diplomat, promoter, and pioneer. He employed various designers for his collections, some known only by their first names, like Stella or Clara. Tabak of California’s new designer, Irene Saltern, has turned out a wearable, practical collection in four fabrics: Menswear wool flannel, rayon flannel, a woolen check and Italian twill-back velveteen. Gray is the favored color, accented with shades of red, green, and gold. There are co-ordinated groups in all the fabrics—the answer to the clothes question for the college girl or career woman. Saltern (a combination of her maiden name Stern and married name Salinger) was already a well-known designer (“known for sensibly-priced Career Girl styles with high-fashion flair”) by the time she went to work at Tabak. She started out as a costume designer for Samuel Goldwyn Pictures, and by 1944 designed her own casual clothing line. Irene Saltern, who has turned her costume designing talents from the motion-picture industry to the manufacture and design of sportswear for the feminine public, has plotted her costume story around casual clothes for work and play. Stressing the importance of line and silhouette rather than intricate detail, Miss Saltern uses a technique which she calls “optical illusion,” a play of bright colors against dark shades that trim the figure down to slim, graceful proportions…This California designer believes that today’s sportswear is not confined to active sports, but is an expression of an informal mode of living, and she has balanced her collection to cover every phase of it. 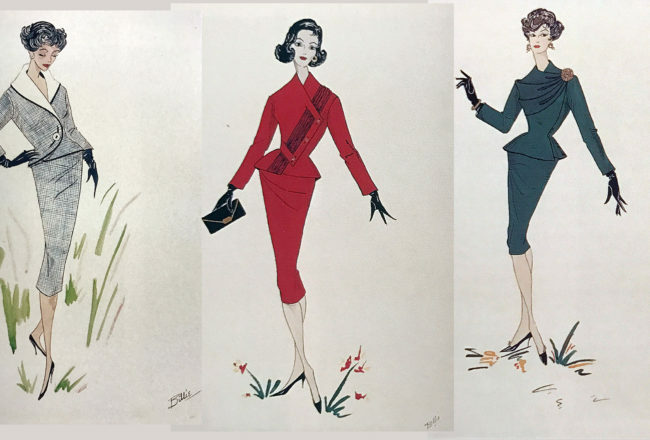 In 1948 and 1949 she designed collections for the Hollywood Premiere label that was very similar to her 1950 collection for Tabak of California, using menswear fabrics and checks for career and college women. She made good use of color in both casual and resort wear, and took patterns and concepts from around the world, like batik prints on full skirts, and sari stoles over sundresses. 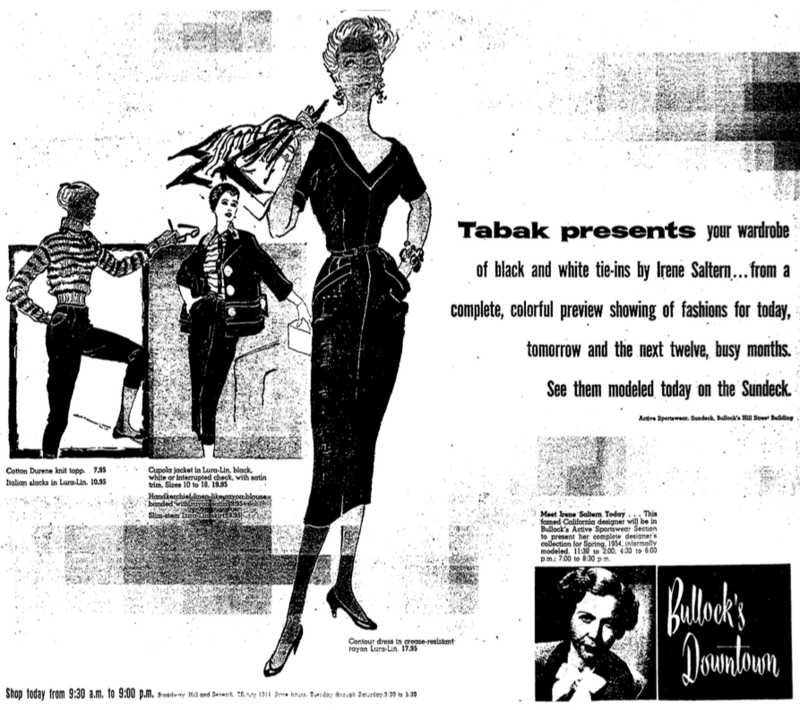 Saltern left Tabak in 1955 to form her own company, Tombarry, where she continued to design separates under her own name. It’s not totally clear what happened to this venture, because in 1957 she went back to designing for Tabak again, and stayed there until 1965. For more about her life and work, there’s a very informative post here at Vintage Reflections. One of her most important contributions to Tabak were Tabak Tie-ins, a set of coordinating separates, often in black and white, to create a ready-made wardrobe. This ad from 1953 also lets you know you can meet her at Bullock’s Downtown and preview her Spring 1954 collection. So my set: was it designed by Irene Saltern? 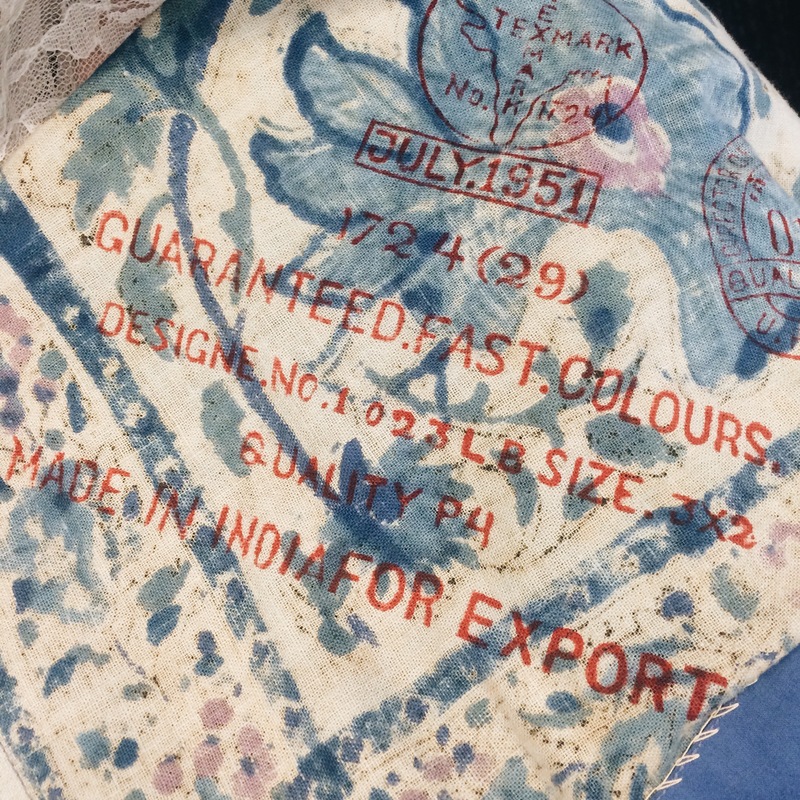 There’s a mark on the inside of the skirt dating the fabric to 1951, but that doesn’t mean the garment was actually made that year or even in the following two or three years. From this black and white scan, the paisley print on these pants and the description of the wrap top seem consistent with my set, the obvious difference of skirt and pants aside. This came out, of course, during the two years when Saltern was working on her own line, so my set’s designer could still be anonymous. My fabric is from India, and this ad describes “Balinese” cotton, but who’s to say they didn’t take a few creative liberties, when at that time “Indian” meant Native American? Whoever designed this, they did a beautiful job. 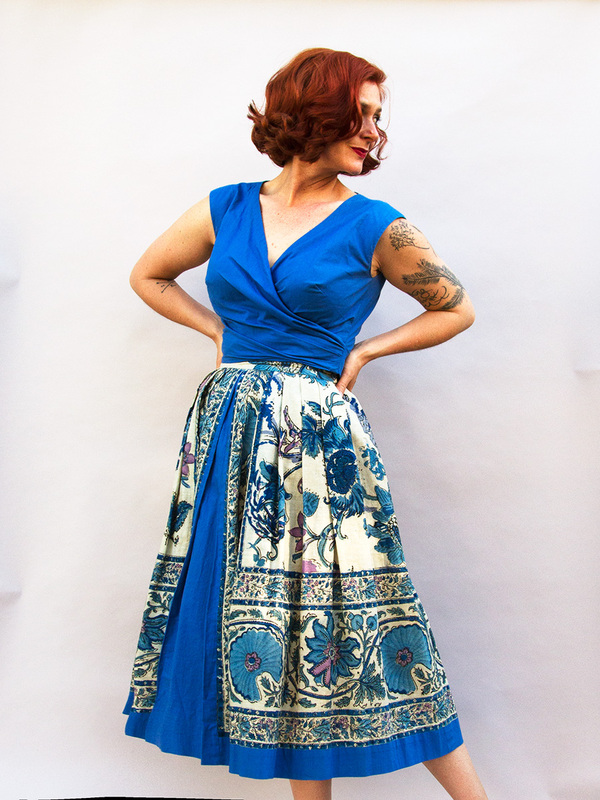 The wrap top has a built-in belt to blend seamlessly with the skirt, and the skirt features a matching blue panel in the center, revealed by the way the paisley cotton is cut in front. A splurge to be sure, but this set will be a valuable part of my closet for a very long time. If you have any additional information about Saltern’s collections for Tabak and know whether my set is hers or not, let me know! So, this set was almost certainly designed by Saltern. I’ve since seen one other in orange, which was also lovely. Lovely set, whether or not Saltern designed it. She did like gathered skirts and border prints, so my guess is yes. Several years ago I was lucky enough to be able to purchase a set of nine matching Tie-in pieces from Saltern’s estate. That’s so cool! I’ve heard that there was quite a collection to be had from her estate. It does look very much like a set she designed that I found a later ad for, in 1960, but yes, either way, I love it! My aunt, Lucy Goldschere, worked for Tabak of California for many years, probably beginning in the 1940’s until the late 60’s or early 70’s. At least twice per year, she would send a huge box full of clothes to WV for my mother and for me, once I could wear adult sizes. They were beautifully made, very stylish and held up beautifully for years. I especially remember a pair of black velvet jeans with a white silk blouse that I wore for gym class in the 6th grade. Aunt Lucy died in the 70’s, but thanks Aunt Lucy. I am a niece of Louis Tabak. My maternal grandmother, was his sister. 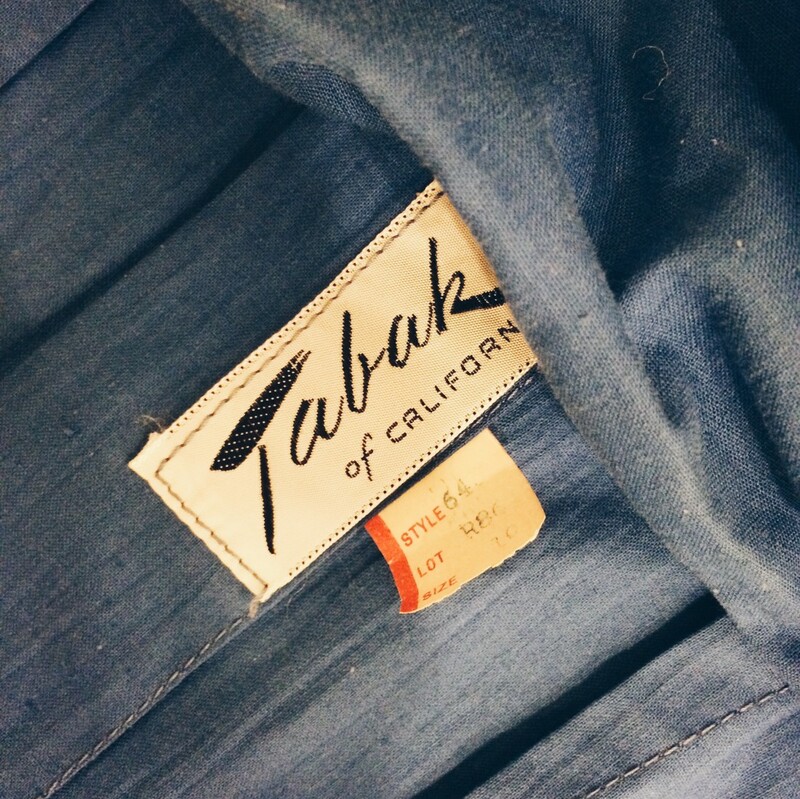 I have a few pieces of Tabak of California sportswear. I have an interesting anecdote regarding two of those pieces which I’d worn while my class visited the Metropolitan’s Costume Institute in the ’70s during college. I still have all of those Tabak of California pieces in my closet. My children aren’t interested in them. I’d like to see the hem go to a good home, perhaps even a costume museum collection. Can you advise me? I have Tabak dress I found in a vintage dress shop. It fits me prefect. I wear it once a year. I call it my Jacky Kennedy Dress. I always get so many compliments on it. It’s over 50 years old and it’s flawless. I fell in love with the craftsmenship of dress before I knew of the name. It’s said’s a lot that I can wear a dress 50 some years later. It’s sleeveless white with black Polk a dots. Very tailored at waist line. It has a built in slip. The hem line is impeccable. I love it. So glad I found your site. Keep in touch.